The National Cycle Network (NCN) is a network of safe, traffic-free paths and quiet on-road cycling and walking routes. The NCN routes in east Kent are 1, 2, 11, 15, 16,17, 18 and 174. Click on the map to see the routes in more detail on Sustrans site. Sustrans also have a map of Kent's cycle routes which can be bought from their shop. All you need do is enter your start and end points and Cyclestreets journey planner will work out the route. Cyclestreets will also work out journey data such as distance, how many calories you'll use and how much CO2 will be avoided by cycling. You'll struggle to find much about local cycle routes on the district council sites, only Canterbury City Council and Dover District Council have made an effort. Ashford Borough Council have a map of routes in Ashford and the Willsborough Dykes path. Thanet District and Swale Borough councils don't seem to have any information about cycle routes on their sites. Similarly, Folkestone and Hythe District Council, although they do have PDF copies of their leaflets for the Lower Leas Coastal Park and Royal Military Canal on their website. ​Potholes and other problems with roads are, sadly, all too common nowadays. If you notice a problem such a pothole, broken street light, or traffice lights not working, you can report this to Kent County Council at http://www.kent.gov.uk/roads-and-travel/report-a-problem. ​Explore Kent is a Kent County Council led partnership initiative with public, private and voluntary sector partners that promote and actively encourage Kent’s residents to access, enjoy and benefit from the great natural resources that Kent has to offer. ​Explore Kent has details of cycle routes and activities for cyclists - and walkers too - and you can also sign up for their newsletter. 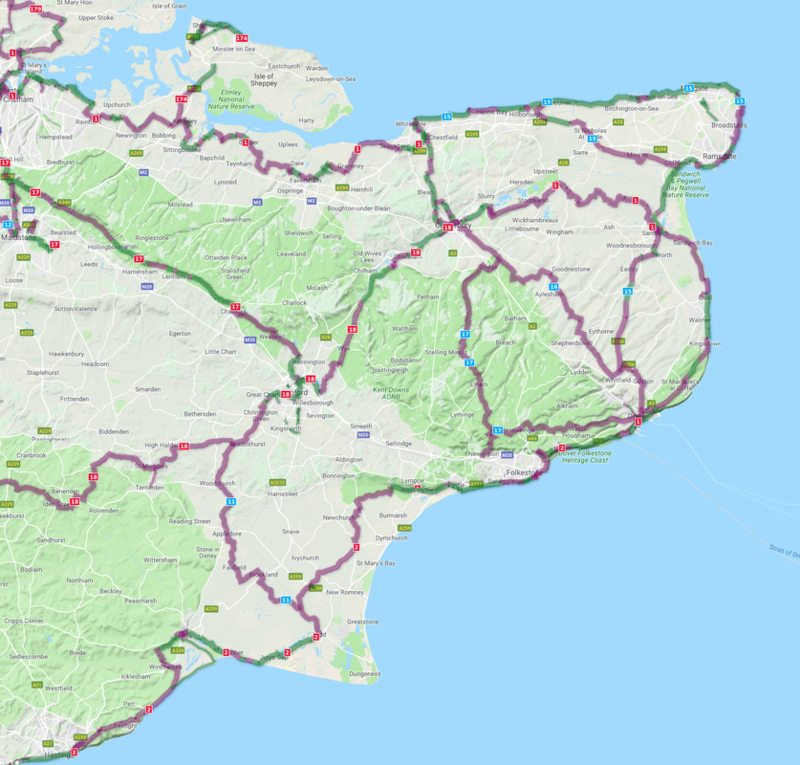 Kent Connected is a Kent County Council initiative funded by the Department for Transport’s Local Sustainable Transport Fund to address peak traffic congestion, improve travel choices and promote more active and sustainable transport modes in Kent. Their website has a journey planner which not only gives you a map of your route, it also estimates how much time the journey will take, how much pollution is produced by each mode (eg walking, bike, car, and public transport) and how many calories you'll use making the journey. It's good. They have produced the following videos of cycle routes in Kent which give a good idea of what each route is like.